Growing blueberries in the home garden can be quite enjoyable. Blueberries have a very fresh taste when picked straight off the bush. Beyond the initial challenge of establishing a new planting, there are really few pests that attack blueberry bushes. Proper weeding, fertilizing, insect and disease control, and proper pruning help to assure quality fruit at harvest. This fact sheet is intended to help home fruit growers gain a better understanding of the principles of pruning blueberry bushes. Refer to the glossary of terms if you are not familiar with some of the terms used in this fact sheet. Why is it important to prune blueberry bushes? Figure 1. Blueberry bushes that have not been pruned regularly tend to produce fewer new shoots and small berries that are of inferior quality. Photo by Gary Gao, OSU South Centers. The biggest and tastiest blueberries are typically borne on strong and newer canes in the upper half of the bush and in more upright position. Any pruning of blueberry bushes, especially mature bushes, is required for successful production of blueberries. Blueberry bushes that have not been pruned on an annual basis may become overgrown and less fruitful (Figure 1). Proper training of blueberries is essential to maintain plant size, shape and productivity. In the ﬁrst two years, it is important to train young blueberry bushes to promote the proper structure of the plant for maximum fruit production. 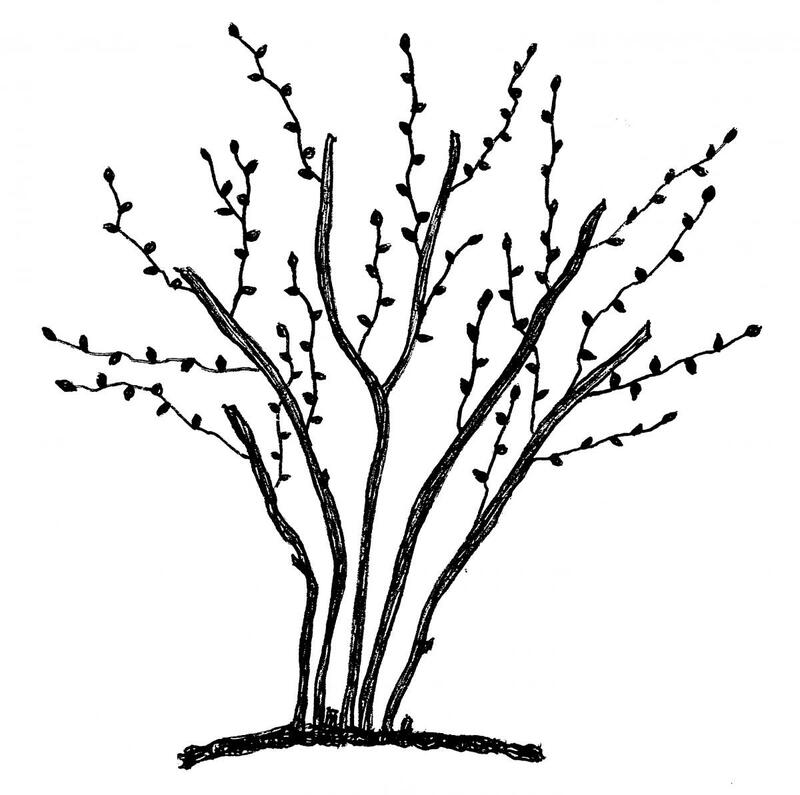 What are the steps to successfully prune a blueberry bush? The best blueberries are produced on 2- to 4-year-old canes. Older canes tend to be weaker and produce smaller berries. Hence, blueberry pruning is a constant renewal process where older canes are removed to encourage new, strong and more upright growth. Refer to Figures 2 and 3 for the types of the canes that need to be removed. Visually observe the blueberry bush. Imagine what the plant should look like when pruning is completed. Look for the strongest canes with the best flower buds and save them. Remove all diseased and broken canes. Remove canes that are seven years old or older. Remove weak and twiggy canes canes with a lot of flower buds. Retain strong canes with many large flower buds. Remove short and low hanging canes. Prune very hard once every a few year to rejuvenate the bushes. One-year-old canes are reddish brown during the winter months and the fruit producing canes. Keep in mind that selective pruning will help to stimulate new cane growth each year. Once you are done pruning, the bush should be: (a) narrow at base, (b) open in the center, and (c) free of vegetative clutter. Figure 2. 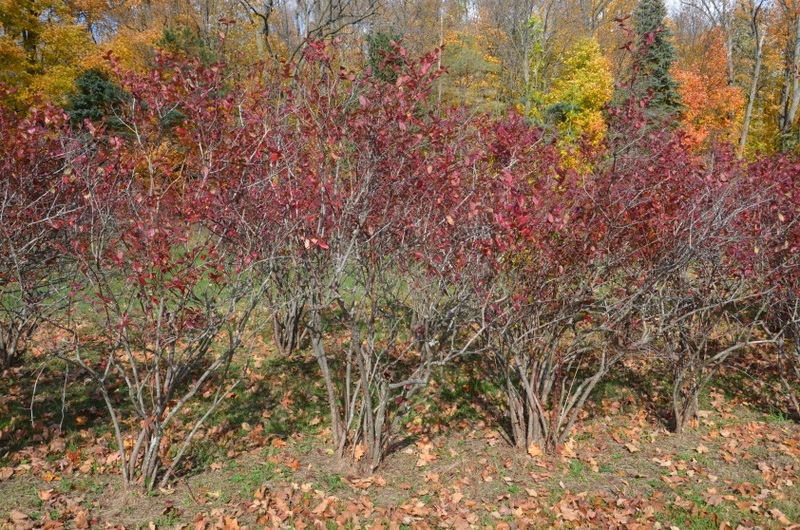 A mature blueberry bush before pruning. Figure 3. 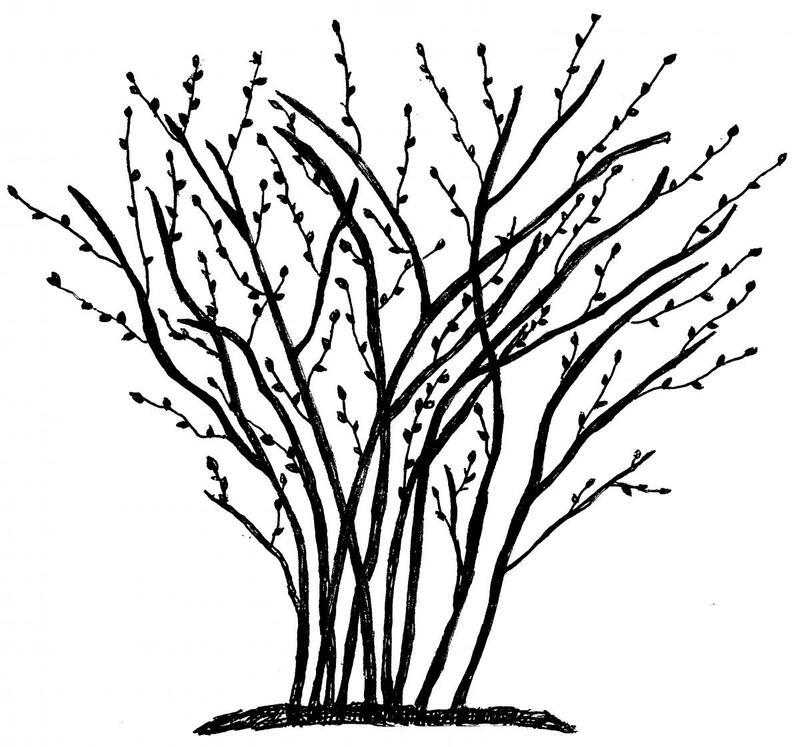 A mature blueberry bush after pruning. Are individual blueberry varieties pruned differently? Yes, different blueberry cultivars should be pruned quite differently. Most gardeners in Ohio grow high-bush blueberries. There are some differences in term of growth habits. For example, ‘Duke’ tends to produce upright canes with few new shoots from the crown. ‘Blue Ray’ tends to grow long and arching canes. ‘Nelson’ produces a lot of new shoots from the crown every year. Cultivars with upright growth can benefit from cane thinning at the top. More arching cultivars can benefit from shortening of long canes to make the bushes more compact. Bushier cultivars can benefit from cane thinning at the crown. Can young blueberries be pruned the same as older, mature bushes? Young bushes generally do not require as much pruning to remove undesirable vegetation. One or two cuts to remove low hanging and weaker canes may suffice. The key to pruning young plants is to focus on setting up the overall plant structure that will make the bush fruitful for several years. Mature bushes normally require more selective cuts to maintain a desired shape, plant structure and productive fruiting wood. Bushes that are seven years old and older will need to have a few mature canes removed to maintain a balance between older canes that are becoming less productive and young canes that are not quite into full production. Mature bushes should have a mixture of canes of different ages. How should older, overgrown blueberry bushes be pruned? Blueberry bushes should be rejuvenated to improve fruit production and maintain proper shape. This may require that several old canes be removed and the bushes be pruned to ﬁt the desired shape. Rejuvenating bushes can be quite a challenge if there has been no annual pruning done for several years. The ﬁrst approach would be to remove any diseased or broken branches. Secondly, depending on the overall number, the oldest two or three canes should be removed to open up the plant structure. As with any blueberry bush, the center of the plant should be open to sunlight and air movement. The base of the bush (at the top of the root crown) should be tighter than the middle to upper portion of the bush. All branches that are touching and crossing should be removed. What are the tools used for pruning? Hand tools, such as loppers, hand pruners and handsaws, can be used to effectively remove all undesired wood from blueberry bushes. Select the appropriate tool to remove wood as cleanly as possible to avoid unnecessary injury to the plant. Hand pruners can be used to effectively remove one-year-old wood. If the wood is two or three years old, it is suggested that a lopper or saw be used to cut through the heavier wood. Learning to master the art and science of pruning blueberries takes time and practice. Contact your county Extension educator for updated information on pruning. Make sure your blueberry bushes are pruned each year to maintain the size and shape of the bushes to maximize fruit production and increase the overall fruit quality. The final test of your pruning work is good sized, tasty berries of abundant amounts year after year. Cane: A green summer shoot matures (hardens off) into a woody, reddish brown one-year-old cane after leaf fall. Fruiting wood: Wood that produces ﬂower buds during the late summer. Pruning: Removal of portions of the canes to help maintain size, shape and productivity of the bush. Shoot: The green, leafy growth that develops from the blueberry bush root crown. Gauthier, N., C. Kaiser, T. Barnes, C. Smigell, J. Strang, D. Wolfe, S. Wright, P. Byers, K. Demchak, M. Ellis, G. Gao, E. Hanson, R. Isaacs, D. Johnson, and E. Stafne. 2013. University of Kentucky Extension Bulletin, ID-210. Midwest Blueberry Production Guide. University of Kentucky, Lexington, Kentucky.